To View the Celebration of Life Video Tribute, Click on the tab above. 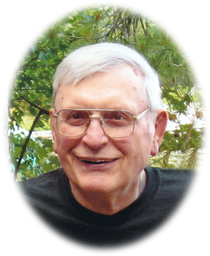 Charles E. “Chuck” Emerick, 78 , of Geneseo, passed away Monday, February 17, 2014 at home surrounded by his family. A funeral service celebrating his life will be held at 10:30 am on Friday Feb 21at Grace United Methodist Church in Geneseo. Rev. Melva England Graham will officiate. Burial will follow at Oakwood Cemetery in Geneseo, where military honors will be accorded by Don Cherry VFW Post 5083. Visitation for Chuck will be held from 4-7 pm on Thursday at Vandemore Funeral Homes, Geneseo. Memorials may be made to Grace United Methodist Church and Geneseo Youth Football. Chuck was born in August 18, 1935 to Joe and Alice (Wahlheim) Emerick. He graduated from Geneseo High School in 1954 and served in the United States Army from 1954-1956 in Germany. He married Beverly "Bev" Peck on May 5, 1957 at Atkinson Congregational Church. Chuck worked at the Geneseo Telephone Company, served on the Geneseo Police Department for a short time, and the Geneseo Municipal Light Plant, where he retired in 1994 after 31 years. Chuck was one of the four original coaches of Geneseo Youth Football. He also coached Little League baseball. He was a lifelong member of Grace United Methodist Church where he taught Sunday School for over 30 years, also serving on various boards. Chuck and Bev traveled the Midwest working at Lay Witness Missions, giving testimony and evangelizing. Chuck and Bev played Santa and Mrs. Claus for many years and enjoyed it very much. Chuck served for five years on the Henry County Sheriff's Auxillary. Chuck loved to fish in northern Wisconsin spending many happy vacations on various lakes with Bev and friends. Chuck is survived by his wife Bev of Geneseo; daughters Dori Sparks of Hayfield, MN, Diane (Tom) Birmingham of Geneseo; son Doug (Shelly) Emerick of Geneseo; six grandchildren, Kelly Sparks of St. Paul, MN, Erin Sparks of Lake City, MN, Connor Sparks of Sioux City, IA, Joshua Birmingham of Wichita, KS, Courtney and Michael Emerick of Geneseo. He was preceded in death by his parents.